Mouse over any Image to see a larger view. PROLOGUE: Our tandem bicycle has been the source of many of our adventures around the world. Once again we embark on another Santana Tandem Adventure, this time to French Polynesia. We had reserved our place well over a year in advance and made travel plans as soon as the itinerary was published. We drove to the San Antonio Airport in time to catch our 3:30pm flight to Los Angeles where we had 5 hours of layover to wait for our 8 hour long flight to Papeete. While in LAX we met other tandem couples who would be joining us on the Air Tahiti Nui flight. We had plenty of time to find a restaurant for dinner before we could check in for the flight. We had no problems with check in or TSA and soon were in the waiting area for the 11:55 departure. By departure time 13 tandem teams had found each other as we waited to board. It is always exciting to rediscover friends we had ridden with on previous Tandem vacations. Fortunately the flight wasn’t full and Becky and I each had a full 4 place row to ourselves for the flight…that helped to make economy travel a lot more comfortable. Sometime around 2:00 in the morning the flight attendants served a meal which was an Asian cold salad with grilled chicken…actually not bad for an economy coach meal. Becky had already fallen asleep and missed the meal. Trying to sleep on a plane has always been difficult for me and this flight was no exception. I managed a brief nap but certainly not a quality rest. We landed on time in Papeete at 5:00am and were greeted with Polynesian Hula dancers to entertain us while we waited in line to clear customs. Bill McCready (our tour organizer from Santana) had arranged for ground transportation to the Sarah Nui Hotel. This was very efficient and convenient to walk outside Customs and into a waiting bus with baggage handlers to load the luggage. The trip to the Hotel was about 20 minutes through the outskirts of the city. My first impression was how similar the city appeared like Manila. Papeete is not a tropical paradise, but a bustling collection of weathered homes and buildings. Checking into the hotel was routine; we were fortunate to be assigned a suite on the top (5th) floor with a balcony overlooking the city with of view of the mountains. After unpacking it was time for a refreshing shower before striking out to find a restaurant for breakfast. With the help of trip advisor, we discovered the Oasis of Vaima which was about a 15 minute walk to the city center. 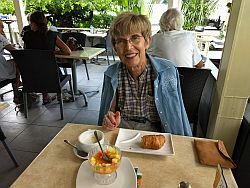 The place was in a Lanai setting across from the Notre Dame Cathedral…both food and service were acceptable. We did wander around for a while visiting the fish and produce market as well as a little window shopping in what appeared to be the main tourist and commerce district. We returned to the hotel with a brief stop at a gas station to shelter from a passing thunder shower. We had plenty of time to relax and recover from the all night flight. Later we decided to venture out with friends in search of a wine shop and some snack supplies. As we walked from the hotel, I saw a sign which said Pavilion du Vins with an arrow pointing in the opposite direction. The place was only 2 blocks away where we discovered an amazing selection of pricey French wines. We asked for a tasting and they accommodated with a Bordeaux which was the featured wine of the day on sale for $14. After tasting and browsing the aisles, we purchased our selections and returned them to the hotel. Then we set out in search of some bread and cheese to enjoy with the wine for happy hour. The hotel clerk gave us 3 possible choices were we might find what we were looking for….the second place was a Shell gas station which had a market attached where we found all we wanted. Back at the hotel we set out the wine, beer and snacks on the balcony and enjoyed the next hour getting to know each other. Later in the evening (about 6:00pm) we walked to a local brewpub (Les 3 Brasseurs) for dinner. The beer was not my favorite but the venue and camaraderie made up for the average beer. By now the toll of the 2 days without sleep was overwhelming and we returned for a very welcomed rest. The pre-race activities began at 7:00am, so to accommodate the early schedule we had to be ready for breakfast at 5:00am. This provided a little time to make final adjustments to the bike as well as a short test ride. 70 Tandems left the hotel together at 6:45 for the short ride to the start of the race. La Ronde Tahitienne is a professional bike race which allows armatures to participate; there were 3 possible distances to ride…70 miles, 35 miles or 16 miles. We chose the 35 mile route. 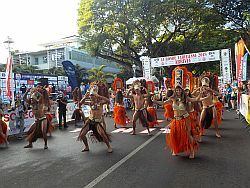 There were a lot of pre-race activities including hula dancing and introduction of dignitaries. By 8:10 we were rolling out of the starting gate and onto the course. The race was very well organized with security at every intersection to ensure safe crossing. There was only one major climb on the route where spectators were tossing flower petals onto the riders as they crested the hill. The route was mostly flat along the coast with an occasional roller. There was a brief rain shower about 30 minutes into the ride which helped to keep us cool in the tropical heat and humidity. We paused at the half way turn- a-round point to take on water and then continue back to the finish. We had a nice tail wind on the return and maintained a higher than normal average speed for us. We finished in 2 hours and 25 minutes which was only an hour behind the winner. At the finish, there was fruit salad and cold water for everyone. We hung around only a short while and then returned to the hotel to wash the bike clothes and shower. Later after resting we ventured out to find lunch…This was Wit Sunday and a holiday in Tahiti so only a few place were open…mostly bars. The first place we tried was closed so we opted for our second choice which was a nice bar across from the Marina where we ordered a pitcher of beer and a hamburger. Friends joined us while we waited to be served and we visited for the next 2 hours waiting for 4:00 when the Santana party would start in the park in front of where the Wind Spirit was docked. 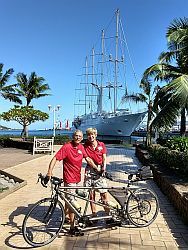 (The Wind Spirit is a 4 masted schooner ( MSY) which would be our home for the next 7 days) At the party we were able to meet with the first week tour participants who had just completed 7 days of riding in the islands as we were just beginning. It was a wonderful time to catch us with friends from the other group all of whom we had ridden with on previous Santana Tours. Once the party was over, we were on our own to find dinner. Someone suggested we try the food trucks which assemble every evening at the marina. The location was only 100 yards away and we agreed to try it. The selection offered a large range of choice depending on which truck you visited. There was waiter table service and real menus for each truck. Becky and I selected a Thai specialty truck and ordered a bowl of Tom Yum Lemongrass soup with chicken. It was very tasty and just what we wanted following the drinks and snacks at the Santana Party. The evening was still early but we were feeling the effects of our bike race and chose to return to the hotel to pack and prepare for the transfer to the Wind Spirit the next morning. Today was the day to transfer from the Sarah Nui Hotel to the Wind Spirit but nothing else was planned. There was a Continental Breakfast in the hotel, but it was not worth of additional comment. We were instructed to have our suitcases in the lobby by 9:00am for transfer to the ship so we had to plan how and what we do based of the clothes we were wearing. Not wanting to be in bike clothes all days we chose casual wear which in hind sight was not our best choice. We should have planned to do a short ride because we not check onto the ship until 1:00 in the afternoon meaning we had to burn about 3 hours with nothing to do and all the shops closed for a holiday. None the less we managed to find friends to visit with and glean important tips about the upcoming cruise. Checking into the ship was routine with the required drills and welcome tips. Lunch was a buffet served at 1:30…very abundant and beautifully presented. We had some time to explore before dinner and of course more information talks about the available very expensive shore excursions. At 6:00pm the ship slipped away from the pier and began the short 11 mile voyage to the island of Moorea. They did hoist the sails for a while but soon went to diesel power. There was some rolling of the boat while the sails were up, but the boat seemed to calm down once we were on motor only. Dinner was at 7:30, but was not a buffet, instead table service with a menu selection. I chose a very light soup because I was still not hungry from the large lunch. We did approach Moorea as dinner concluded and went onto the deck to watch us enter the lagoon through the narrow passage of the barrier reef. Now the water was totally calm which ensured a pleasant evening. We did some star gazing before returning to the dining room for some sorbet and coffee and the off to our cabin for the evening. The day starts early on the MSY Wind Spirit with continental breakfast and coffee available on the pool deck at 6:00am. Breakfast in the main dining room begins at 6:30. There is a complete buffet, but one can also order from the menu for a more exotic breakfast or visit the custom omelet station. For the 1st day I chose to try the buffet, but Becky made the better choice taking a specialty eggs Benedict from the menu. At 7:30 Bill started his route talk, explaining the code for the GPS routes we would be using during the day. 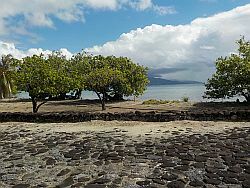 The route was a full circle around the island with a couple of optional side trips to points of interest in the interior. The bikes were loaded onto a barge and transported from the ship to a staging area on shore. We disembarked into the tender about 8:00am and were soon under way. The road is nicely paved with a usable bike lane in some stretches. Of course the road lies right along the water so all the navigation we really needed was to keep the water on our right. There were some suggested stops at churches and the like; one stop included a visit with the mayor of the local province at a new park which had formerly been a club Med. There was a nice beach and clean restrooms with showers. Here we met up with Art and Linda and continued to ride with them for the rest of the day. The water kept enticing us to stop and take a swim and soon we found a good place to stop along the beach and go swimming. The water temperature was very pleasant with plenty of sea life to observe. We had taken our mask and snorkels so we could see the activity in the water. After a half hour pause to swim we were back on the bike to continue our circumnavigation of the island. Around noon we found a restaurant which specialized in Asian food. We ordered a plate of vegetable fried rice while Art and Linda order Chicken ala orange. We shared our selections and enjoyed the break. Following lunch we followed the road around occasionally stopping for a photo op. 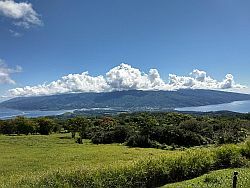 We came to the one major hill of the day but the view from the top was worth the climb affording a view of Tahiti six miles away as well as the Sofitel cabanas on stilts over the water. Soon we had completed the 38 mile loop and now rode an additional 3 miles to a distillery that made rum from the local fruits. We had a tasting and had hoped to enjoy some tropical rum drinks but they only provided a tasting and could not serve drinks. So we bought a bottle of vanilla rum and made plans to enjoy it later that evening. Next we found a bar with a view of our ship and ordered the drinks we were wanting back at the distillery. We were close to the tenders for the 5 minute ride back to the ship where we off loaded our bike and headed immediately to the swim platform off the stern of the ship. We only had 10 minutes to enjoy the water before they closed the platform. Now we had plenty of time to clean up and relax before the program at 6:30. 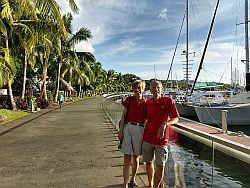 At 5:30 in the afternoon, the crew of the Wind Spirit hoisted anchor and set sail for the 11 hour voyage to Raiatea. During the evening program, we met the captain and principle members of the crew and enjoyed a glass of wine. Dinner was at 7:30 followed by music and dancing in the lounge…but we chose to take our bottle of rum to the veranda deck and try it with some coke as we sat outside under the stars. Unfortunately none of us thought the rum was very good, leaving the glasses half full and we said good night for the evening. The ship arrived about 6:30 in the morning while we were having breakfast. This morning I chose the eggs Benedict off the menu while Becky visited the omelet bar. Bill gave his route talk at 7:30 explaining the various options of the day. As we disembarked from the ship at 8:00, there was entertainment with music and dancers to welcome us to Raiatea. There was a collection of huts along the quay where one could shop the local vendors for arts and crafts but we chose to start our ride heading for a pearl farm. The building, shop and showroom, was on a long pier over the water. Here the owner explained the process to take a 2 ½ year old oyster and seed it with a nucleus and a snip the mantle from a mature oyster to get the desired color of the pearl. After 1 ½ years the pearl is harvested and the oyster is implanted with a second and larger nucleus which grows for another year before it is harvested. Then for the 3rd time the oyster is seeded with a 3rd and larger nucleus for the final pearl of this oyster’s life. At six years old the oyster is no longer capable of producing a pearl with any color so there would be no value. The French Polynesian pearl industry is highly regulated to ensure quality and authenticity. From the pearl farm we continued our ride to Marea Taputapuatea which is a UNESCO site to preserve one of the ancient sites of the early civilization. This site was of religious significance but today was just a collection of rubble from a former time. There were no recognizable buildings or structures. By now it was close to noon and we decided to find a nearby hotel with the idea of getting some lunch and maybe do some snorkeling. The hotel was less than a quarter mile from the UNESCO site and the dirt road approach was not very inviting however the place turned out to be a nice boutique motel with an excellent restaurant. They had fresh lobster and fresh tuna which we certainly enjoyed for lunch. We asked for permission to use their beach which they were happy to allow. We swam and relax for while allowing our lunch plenty of time to settle before we started the 18 mile ride back to the ship. The route was mostly flat with only a couple of rollers. We stopped once to buy water and a few times for photos, arriving back at the pier before 4:00. We changed into swimwear and went to the pool deck for refreshment and relaxing. Neil has gone scuba diving in the afternoon and was expected to return after 5:00. We showered and changed and met Sally at a local pub where Neil was certain to pass as he returned from his dive. We ordered some beer and as expected Neil appeared full of stories about his diving adventure. There were only a few minutes before we had to be back on board for the 6:30 program talk. Normally this is an informative briefing detailing the next day’s events, but Bill starting talking about an upcoming Santana Adventure Tour of the British Isles. Unfortunately the talk was way too long and too detailed so that he lost the interest of many of the captive audience. But fortunate we were seated next to the door and exited before the end of the talk. We went to the pool deck where the crew had set up for the anticipated outside barbecue. We managed to get through the line before the crowds arrived, but also just as rain started to fall. Chaos began as people looked for cover from the rain. They crew changed the venue back inside the restaurant but the buffet remained under cover on the pool deck. The buffet was a complete selection of grilled meats including a roasted pig, fish, chicken, ribs and lobster as well as the largest pan of paella I have ever seen. Following dinner and dessert we chose to skip the evening program of line dancing and returned to our cabin to rest. At 5:30am the Wind Spirit’s captain started the diesel engines and pulled from the pier at Raiatea and set sail for the short cruise to Taha’a…a small island inside the lagoon. We had some time to enjoy breakfast before Bill’s route talk at 7:30. There was a pretty sunrise and we were fortunate to be on the upper deck to capture the event in photos. After breakfast, we tendered to shore where our bikes were waiting for us. 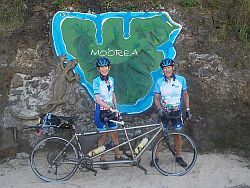 We had arranged to borrow a new titanium tandem from Bill which he had available. It was his latest model with electronic shifters and new geometry. We installed our pedals and adjusted the seats and handlebars to fit us and then we were on our way for the flat coastal road around the island. 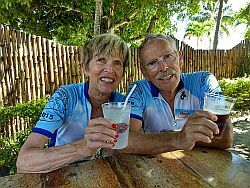 We were riding with Art and Linda Saxby who were on a mission to visit at a pearl farm 12 miles from the ship. The farm was more interesting than the first one we had visited because the employees were busy harvesting the pearls and grafting the next nucleus for the next pearl in the cycle. The showroom was full of beautiful pearl jewelry and many of the ladies (including Becky) couldn’t resist the chance to purchase authentic Tahitian Pearls. From the pearl farm we continued to the rum factory to taste some of the local rum; to my taste they were only average rum but the Passion Fruit rum was certainly unique. At the rum distillery we reversed our direction to back track to the ship stopping at the coconut exhibition to enjoy some fresh fruit and entertainment as well as lesson on coconut farming. There was one final stop before returning to the ship at a vanilla farm, but we chose to skip this one. The route around the island was one of the most picturesque of the trip with beautiful tropical views of the water and island. Back at the dock we stripped the loaner bike of our pedals and bags and boarded the tender for the return to the ship. The afternoon activity was a visit to a private island for a hamburger lunch and some quality beach time. 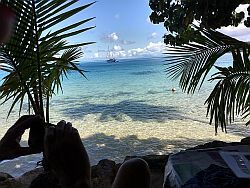 After laying claim to a couple of chaise lounges we ate lunch and then relaxed for a while before donning mask snorkel and fins for a swim around the coral formations. There were some tropical fish and coral to see but not enough to hold our interest. Back on land we visited the bar for a couple of Coco Locos to cap off this exotic visit to the tropical paradise. We had to return to the ship at 4:00 to clean up and prepare for the evening. The schedule was becoming routine with the 6:30 cocktail hour when the next day’s program would be explained. The dinner tonight was in the main dining room featuring a Tahitian Shrimp and rice dish. No one seemed to be interested in any late night activities so we returned to our cabin after dinner. During the evening the Wind Spirit had repositioned to the harbor at Bora Bora. We awoke anchored a few hundred yards offshore of this beautiful island. Our routine was to meet on the pool Deck for coffee and to watch the sun rise before going to the dining room for breakfast. As the week progresses, the breakfast room becomes less crowded although this particular morning, some guests were left searching for seats. Bill gave his usual route talk at 7:30 explaining the sight we would be visiting as we rode the 18 mile long circumference road. We had to find our bike and reinstall the pedals and frame bags since we had removed them the previous day to be able to ride the loaner Titanium. There was a welcoming ceremony with the mayor and other dignitaries as well as some costumed dancers. After their program we were ready to roll out. Our first stop was at a house where they were demonstrating how to make the thatching for the roofs of the hotel cabanas. We continued a couple of more miles before stopping at a local tie dye shop where we learned many different ways to tie the Polynesian wrap. During the next leg we climbed the only hill on the island where American soldiers had installed canons during the 2nd world war. We coasted down the hill stopping at a beautiful stretch along the beach to take photos. We stopped once more at a resort where Miss Bora Bora of 2017 greeted us and gave an ice cold coconut to drink. Our final stop was at the iconic Bloody Mary’s beach bar where we bought tropical drinks and tee shirts. We had only 3 miles to complete before we arrived back at the tender/ferry terminal where we boarded the tender at 12:30 for the quick shuttle back to the ship. We went to lunch in the veranda and then Becky went to the swim platform while I returned to the room to try to rest and recover from symptoms of a sore throat and cold. At 4:30 we assembled in the lounge to begin boarding the catamarans for the trip to the private island of Motu Tapu This was a party island where we were treated a beautiful sunset before being seated for a wonderful buffet of grilled tropical meats, salads, vegetables and desserts. Following dinner we were entertained by a group of musicians and dancers. These were by far the best and most entertaining group we had seen of the entire cruise especially the men fire dancers. The evening was very pleasant with a comfortable breeze and a 3/4 moon overhead. The catamarans returned us to the Wind Spirit about 8:15 and that’s the last thing I remember about the evening. 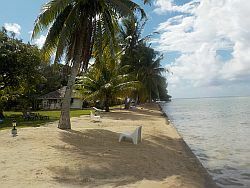 Today would be our last day to ride on this bicycle cruise through this tropical paradise. 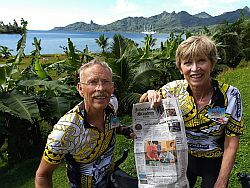 The Wind Spirit had repositioned into the harbor on Huahine and as per usual we were ready to ride following Bill’s route talk in the Amphora dining room at 7:30. Actually there are 2 islands connected by a short bridge. The route of the large island was to ride the perimeter road stopping at a couple points of interest. The first stop was a puppy’s foot shaped rock which bore some legend of how a great dog had rescued the island from a demon. The next stop was at the site of an archeological dig of a civilization dating back to 850AD. We soon arrived at a major hill with a grade approaching 20%. Only a few chose to attempt the climb and descent while most took the provided truck transport over the hill. As we waited to board the trucks, we observed some very large eels swimming is a small fresh water stream. These eels were the only known species to have blue eyes. After crossing the hill we had only a few miles to complete the 23 mile ride around the island. 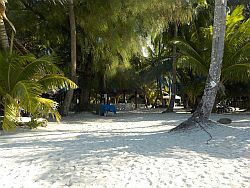 The smaller island, Huahine Iti, was only 16 miles around and offered two hills to climb as well as some idyllic beaches. As we were passing the gorgeous beaches we saw an unimposing sign for a restaurant. Wanting a break and a cold beverage, we decided to stop in…this was one of the best decisions of the entire trip. The restaurant was on the beach with outdoor seating and natural sand for the floor. We ordered a round of beers to get the party started. They would not take our food orders until noon which was only a few minutes later. We ordered a Polynesian shrimp and rice dish while Art and Linda ordered a local fish and rice plate. Fortunately we had chosen to split the plates which were too abundant for one person. We enjoyed the lunch and an additional beer before entering the water for a swim and relaxation. They offered us a shower to rinse off after the swim before we continued on to the tender dock. The return to the boat was less than 10 miles giving us a total of 35 miles for the day. We were the last bikes to arrive back on the boat so we had plenty of space on the tender for us and our bikes. Back on the Wind Spirit we had to disassemble our tandems and pack them into the traveling cases. This always takes about an hour, but soon we were ready to shower and dress for dinner. 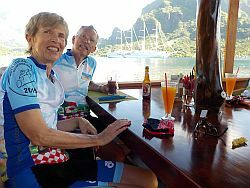 We met Sally and Neil on the Veranda deck to share a bottle of wine while we watched the sunset on our voyage back to Papeete. The dinner was a special offering of Surf and Turf (beef tenderloin and lobster). Best meal of the cruise on board with a Grand Marinier Soufflé for dessert. After dinner we went to the lounge to visit with the entertainers and dance and enjoy one final drink before shutting down for the night. The Wind Spirit sailed all night arrive in the Papeete harbor at dawn. We had time for breakfast before we had to disembark at 9:00am. 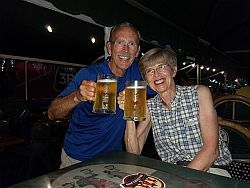 We had made plans to rent a car with Sally and Neil to tour the island while we waited for our midnight flight departure. Tahiti Nui (big) is about 35 miles around. 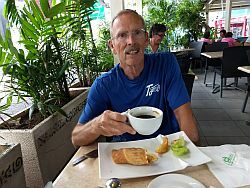 There are a couple of sites worth seeing…we first stopped at a resort hotel hoping to enjoy a coffee break but our timing did not agree with the hotel restaurant schedule and we could not be served. Not to worry we continued our tour stopping at a waterfall for photos. 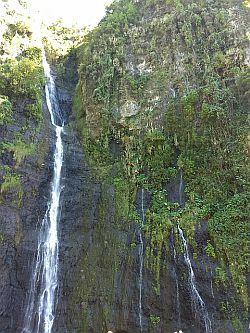 As we continued around the island we turned onto Tahiti Iti (little) to visit an observation point on the highest place on the island. The drive up the mountain was pretty sporty, but the view at the top made the experience worthwhile. 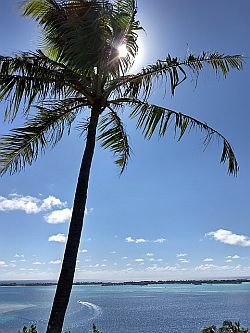 Our next quest was to find an open restaurant for lunch…we soon discovered that the Sunday was the Tahitian Mother’s day and there was no possibility to find an available table without prior reservations. 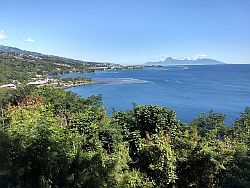 Our only option was to return to Papeete and find a restaurant there; Sally and Neil suggested a place where they had previously been to so we found it and fortunately they could accommodate us. We ordered a pitcher of beer and lunch trying to kill as much time as possible while we waited for our midnight flight. We also walked along the marina, looking at the boats until it was time to drive to the airport to return the rent car and collect our luggage and check-in for our flight. The Papeete Airport is not very comfortable, there wasn’t a restaurant only a snack bar which wasn’t very appealing. Eventually the time passed and we were on our way to Los Angeles. The flight arrive a little early giving us plenty of time to collect our luggage and transfer to the United terminal for our continuation to San Antonio. We were supposed to make a connection in Denver, but due to a thunder storm which closed the airport we diverted to Colorado Springs. By the time the storm passed and we were allowed to finally land in Denver, our connecting flight had departed for San Antonio. Our best option was to spend the night in Denver and catch a flight the next morning. Fortunately, this worked flawlessly and we arrived in San Antonio with our luggage on time.